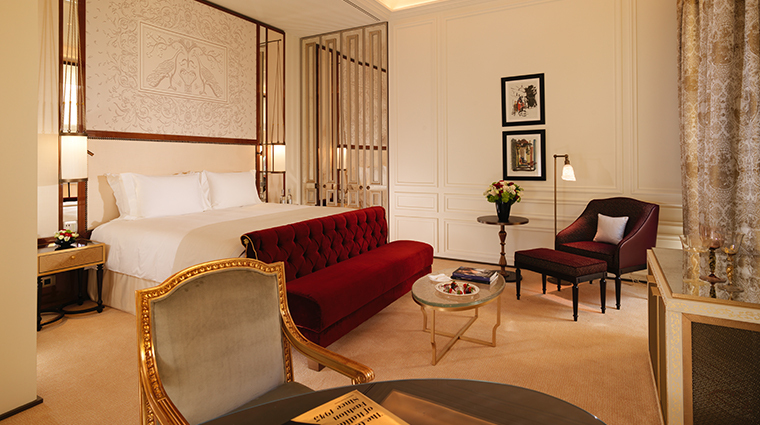 When it debuted in 1889, Hotel Eden was definition of Rome elegance, a title the hotel maintains to this day. 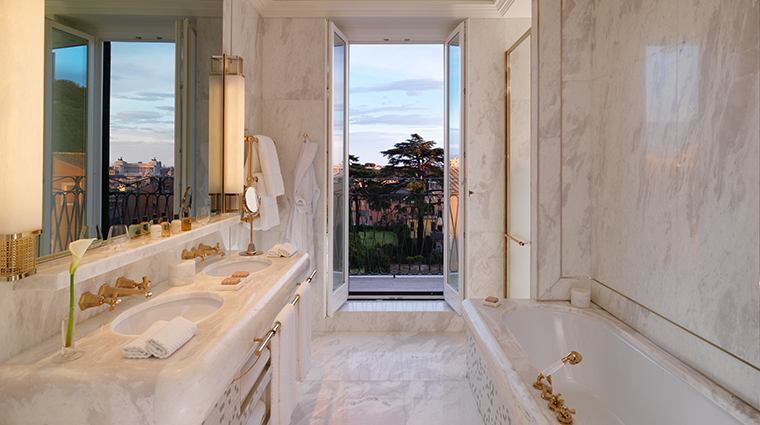 The Forbes Travel Guide Five-Star hotel is known for having the best address in the Eternal City — a corner perch in the via Veneto neighborhood, the original La Dolce Vita area, known for its tranquility and stunning views of the city. And with its April 2017 reopening, Hotel Eden proudly reigns as the undeniable harbinger of style and hospitality. The hotel upgraded its look to classic yet very contemporary art deco, with high-ceiling rooms, custom furniture and wide space. 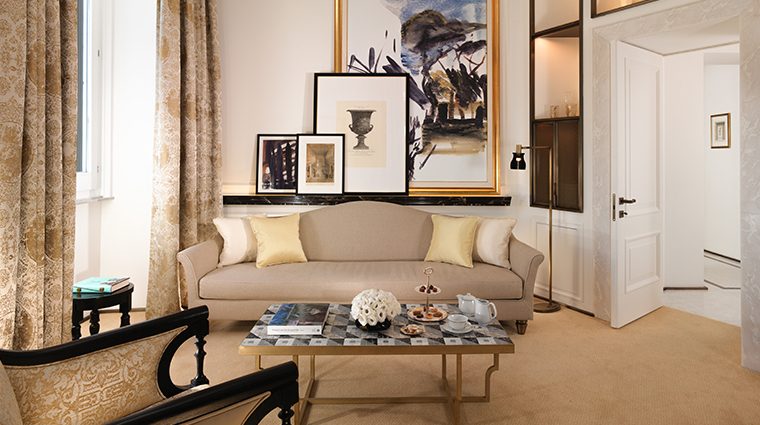 Personal touches are key in all Dorchester Collection properties, and Hotel Eden in particular, with state-of-the-art in-room services to the clever shoeshine, dental and beauty kits. 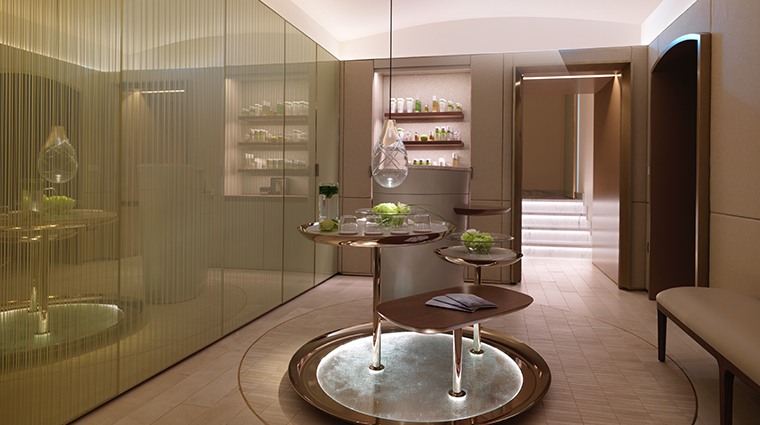 Don’t miss the other amenities: Noted chef Fabio Ciervo oversees the hotel’s two restaurants, the bar and all room service menus, while Los Angeles skin care guru Sonya Dakar makes her first European appearance in the new Eden Spa. 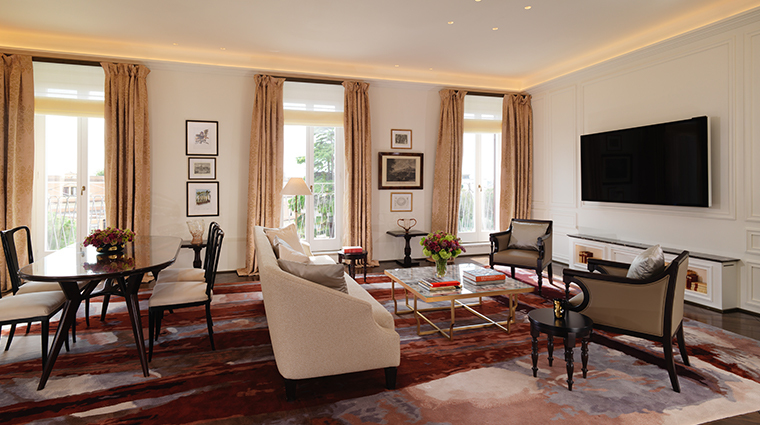 The renovation was a floor-to-ceiling overhaul that emphasized better use of space. Public areas are comfortable, livable and have a logical flow, while rooms are both more spacious and personal (Hotel Eden downsized room count from 121 to 98 to open them up). General manager Luca Virgilio is always onsite, living the Dorchester model of personal touch. 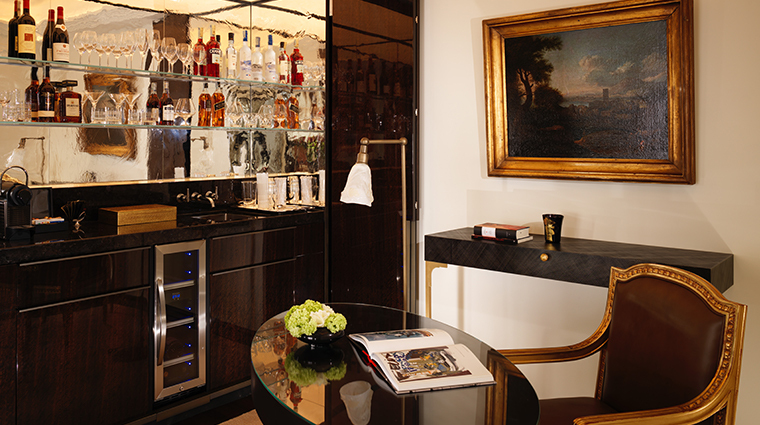 Part of the renovations included a 30 percent staff increase, creating a far more boutique feel to the luxury hotel. Virgilio also installed a guest relations team to coordinate bespoke experiences. The concierges are among the best in the city. 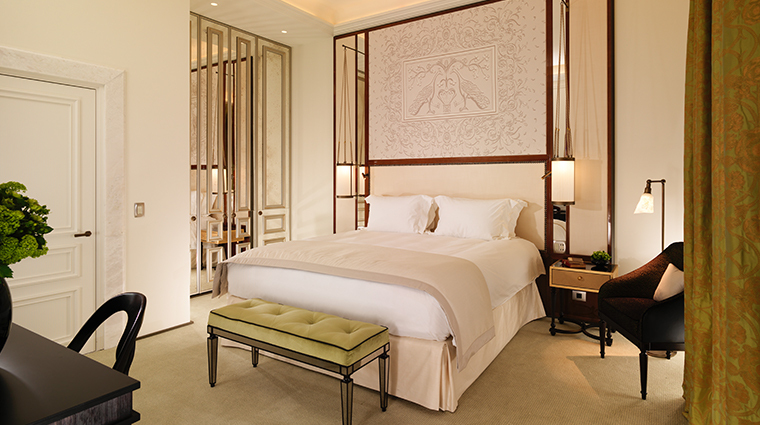 Hotel Eden was known for having Rome’s top concierge, Maurizio Pangrazio. When Maurizio retired in 2015, Alessandro Arciola took the mantle, and dare we say he could be even better than his mentor. 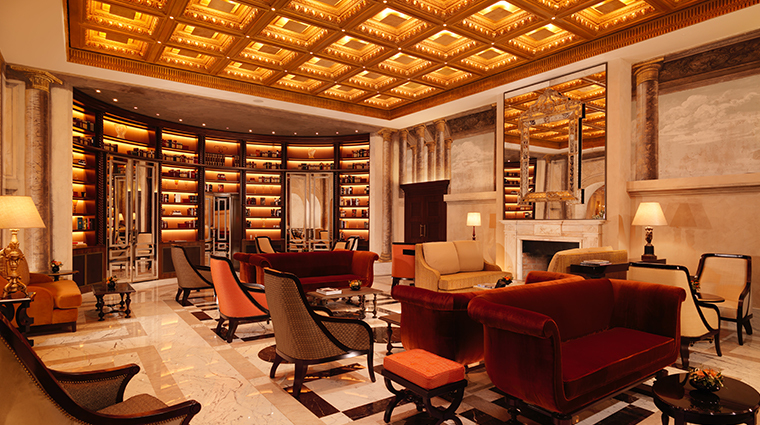 Hotel Eden’s ground-level lounge La Libreria, a gorgeous jewel of a sitting room/library with a golden box ceiling and color-marbled walls, is the perfect setting for a moment of relaxation. Take a look at the bookshelves, especially the left side, where the Secret Bar opens for in the later afternoon hours. 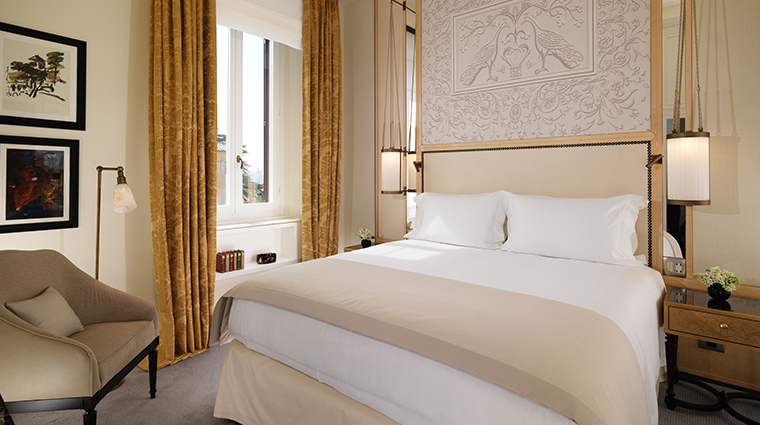 Hotel Eden is the premier Rome hotel for exclusivity and privacy while being in the city center. In other words, it’s the kind of place where you can hide out while being in the thick of it all. Its quiet corner location guarantees you won’t be overrun with tourists or paparazzi. For the best city vista, ask for a view facing via di Porta Pincia/Villa Malta/Villa Medici. The via Ludovisi rooms don’t have much in the way of a view. Skip rooms below the third floor, and avoid any internal courtyard. 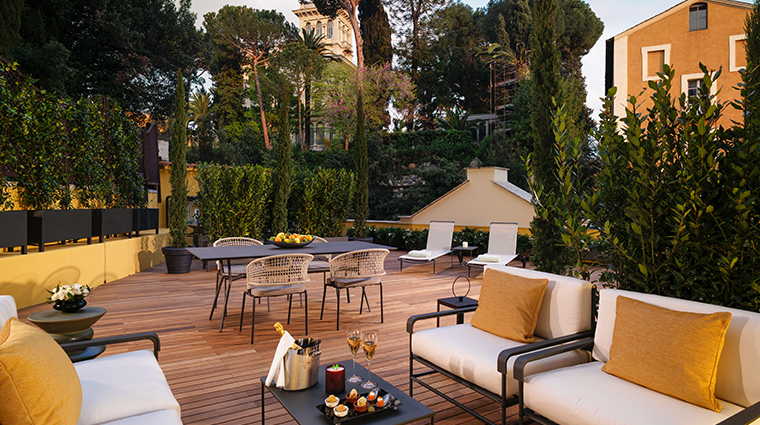 Hotel Eden offers a breath of fresh air, whether it’s from its terrace or its close proximity to Villa Borghese, Rome’s largest park and broadest green space, just a four-minute walk away. 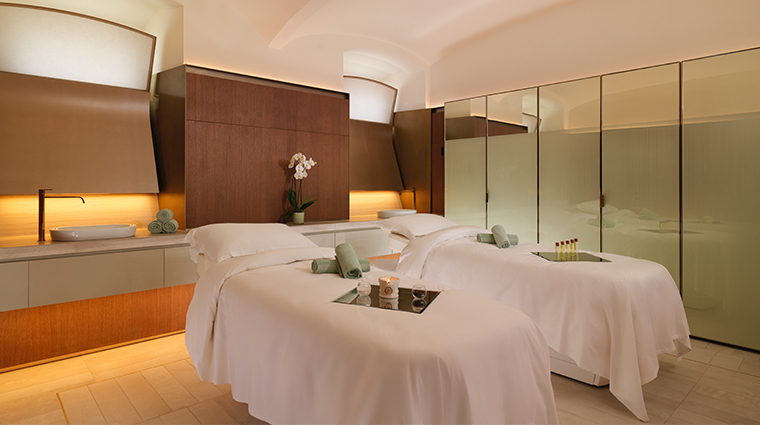 The spa has one couples suite and two individual suites, so as soon as you book the hotel, reserve your Sonya Dakar signature body treatment to ensure a space. You’re going to need it after a day of walking around Rome. 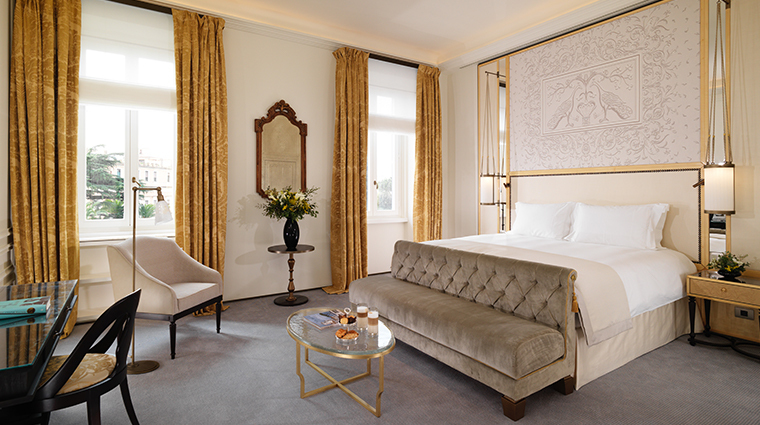 Hotel Eden’s rooms boast high ceilings, large picture-frame windows, custom furniture and lamps and rich white linens. 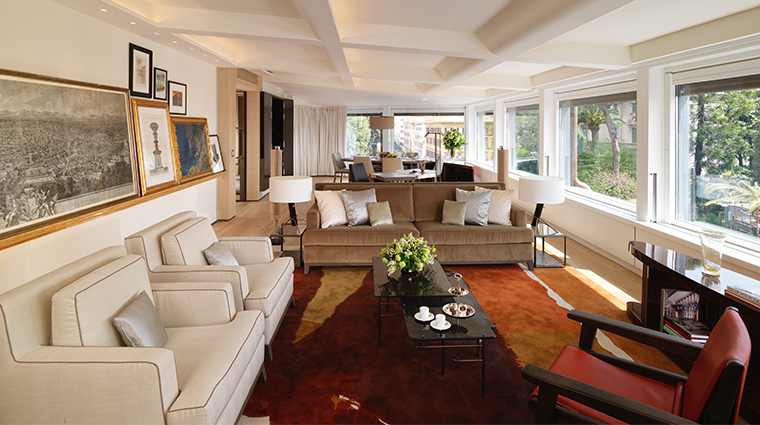 The contemporary art deco décor comes in a relaxing palette of ecrus and ochres. You’ll want to stay inside all day (or at least for an hour) playing around with the in-room, iPad whose capabilities include temperature and lighting controls. 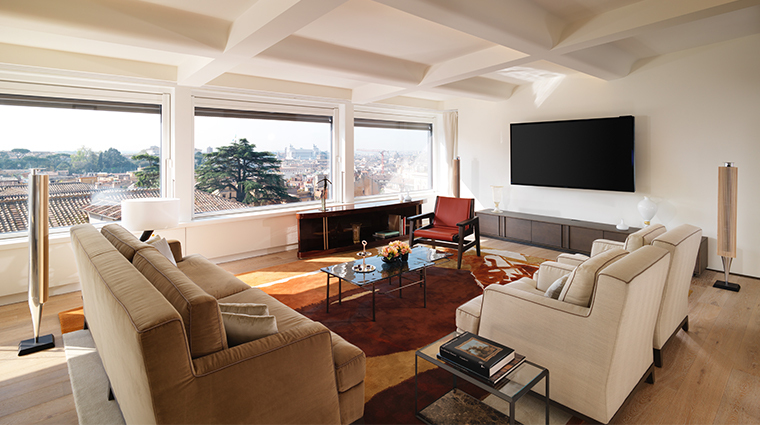 Cinema buffs will love the Bang & Olufsen televisions and sound systems, but we were equally impressed with the collection of Rome-centric books, including Shawn Levy’s Dolce Vita Confidential. It’s great pleasure reading for the luxury hotel. 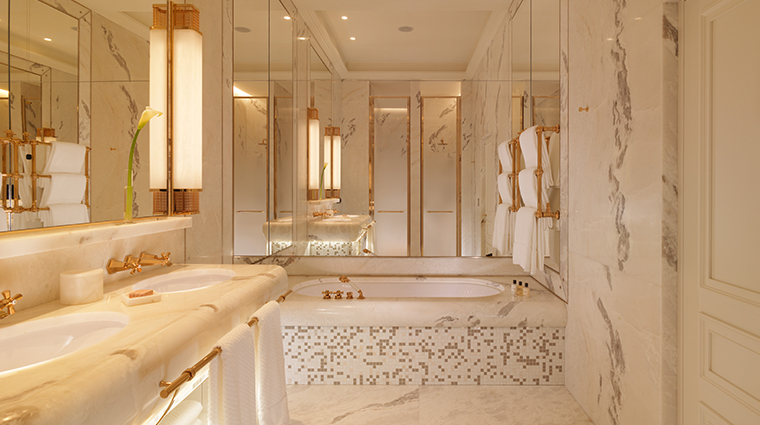 Bathrooms are beautiful examples of simplified luxe — floor-to-ceiling white marble, walk-in rain showers and separate bath, and tasteful gilded fixtures. 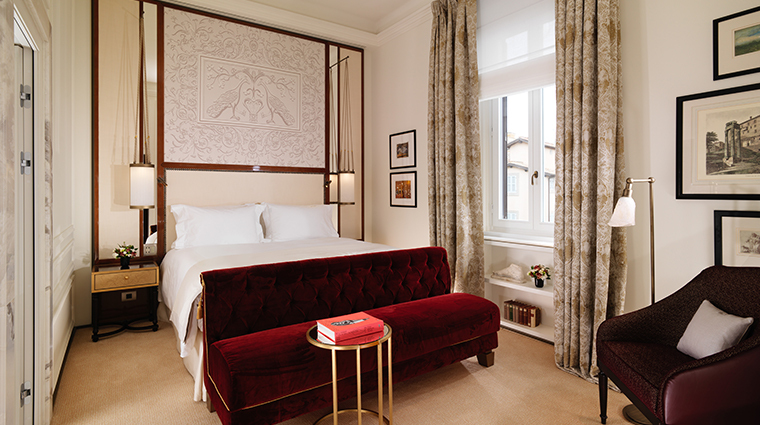 Our favorite details are the in-room amenities, including the Bottega Veneta beauty kits, GHD hairdryer, customized his-and-hers beauty bags, a Hotel Eden LP and gorgeous vintage wallpaper-paneled closets. 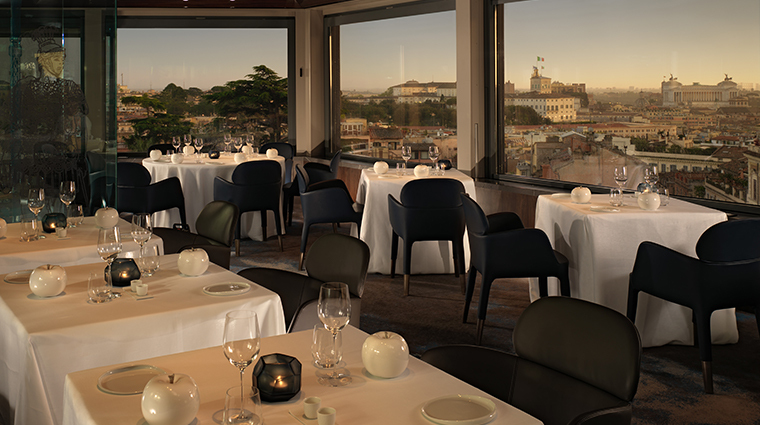 Hotel Eden always had the most enviable rooftop restaurant in the city, with its sweeping Rome views. 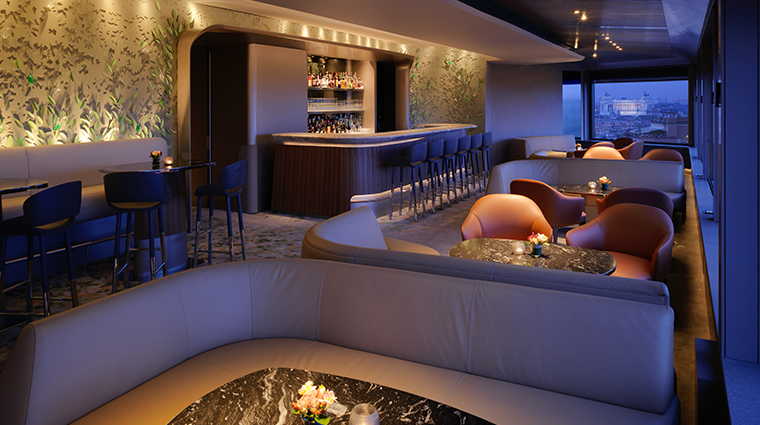 Its 2017 reboot by designers Patrick Jouin and Sanjit Manku added a terrace garden with a nature-inspired wall and cascade awning, a curvaceous and contemporary cocktail bar, and La Terrazza, the hotel’s gourmet restaurant with show kitchen and chef’s table private dining experience. 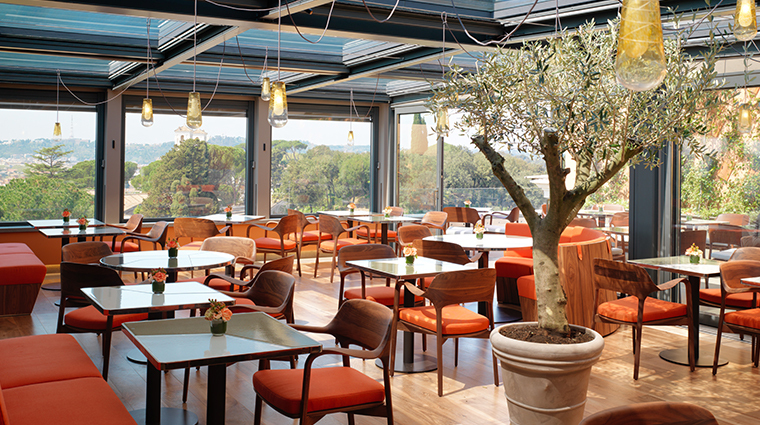 Lauded executive chef Fabio Ciervo returns to his panoramic outpost with new recipes and an even more invested quality-of-life focus (in the early 2000s, he was one of the first chefs in Rome to have nutrition and wellness menus as well as source local producers). Ciervo’s new signature dishes include an evolved spin on the traditional cacio e pepe pasta, using Madagascar pepper and rose perfume, and his stracotto di manzo, a delicious long-cooked beef that will leave you speechless. Cocktail bar La Libreria strives to be the next Roman aperitif scene, with Ciervo’s unique cicchetti (special finger foods) and cocktails by barman Gabriele Rizzi. Our pick is the Grande Bellezza, a pink vermouth cocktail that goes down easily, especially when you’re watching the sun set behind St. Peter’s Basilica.